Where Was God When Israel Deported African Refugees? How should religious institutions respond when the regimes that rule the territories they inhabit incite racism and carry out ethnic cleanings? Seventy-five years after Pius XII became pontiff on the eve of World War Two, his successor Francis is still wrestling with this question. In an interview last week with La Vanguardia following a visit to Israel, the reigning pope admitted that Pius made mistakes, but defended his record, as well. Although the wartime pope didn't speak out against anti-Semitic crimes committed by the fascists, he did hide dozens of Jewish babies from them, Francis insisted, and holding his tongue may have saved the lives of those infants. Was that enough? In Israel itself, the question of how institutions of faith should respond to a state-sponsored drive for racial-religious purity is also of great relevance today. While it is Palestinian Christians and Muslims who have traditionally borne the brunt of efforts to Judaize, or de-Gentile-ize the country, another ethnic out-group has competed with them in recent years for the wrath of Israeli ultra-nationalists: African asylum-seekers. After 60,000 sub-Saharan Africans, Christian and Muslim, sought refuge in Israel from political persecution and ethnic cleansing, Prime Minister Benjamin Netanyahu launched a multi-pronged campaign to expel them all. After building a fence on Israel's border with the African continent to prevent any further entry by asylum-seekers, the government began rounding up those already living in Israel and sticking them in containment centers, to be detained there indefinitely. The stated intention of these spartan camps is to sap the Africans of any hope of achieving freedom in Israel, so that they will give up and grudgingly agree to go back to the horrors they fled from. Netanyahu's justification for their draconian treatment: the Africans' non-Jewishness "threatens the social fabric... and our national identity." 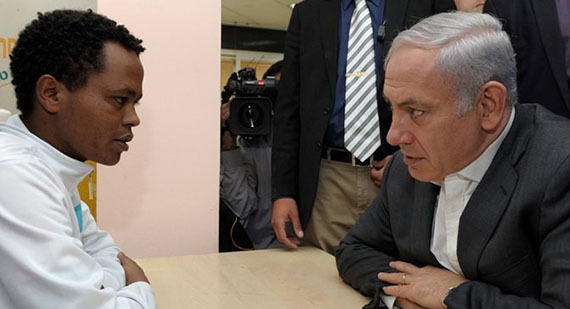 While the government works to sweep asylum-seekers off its streets and decant them back into the interior of the African continent, the vast majority of Jewish religious institutions and lay leaders in Israel have not made any attempt to aid the Africans. Rather, many have drummed up support for the government's actions, and more have riled up their constituents to demand even more extreme action against them. Hundreds of rabbis on the state payroll signed edicts forbidding Jews from renting apartments to the asylum-seekers, and some even issued verdicts of "rodef", or death sentences, on those Jews who dare to do so. In other Western countries, the main complaint lobbed at immigrants by the reactionary right-wing is that they cling too much to their traditional customs and resist assimilation. In Israel, tellingly, it is exactly the opposite: the chief grievance of those who want all the Africans gone is that they do assimilate. Signs of successful absorption -- learning the language, intermingling with the local population -- trigger panic among many Jewish Israelis, and among religious Jews, even more so. Even when they want to convert to Judaism, every single African applicant is outright rejected. Just last week the cleric responsible for all conversions explained Israel's policy thus: "The government built a fence... on the state's border, and we built one here, at the entrance gate to the Jewish people." 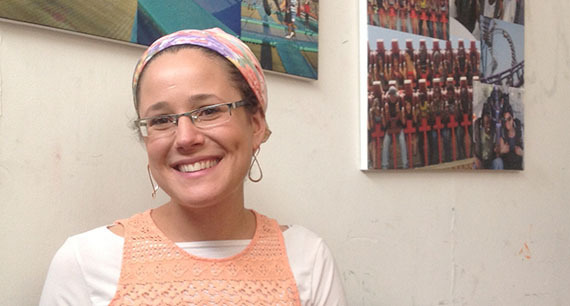 Surrounded by near-unanimous demands for the de-Africanization of Israel, Bracha Shapiro stands out as one of the few religious voices of dissent. Raised in an ultra-Orthodox Jewish community, she continues to live her life based on halacha, Talmudic law. Yet unlike the vast majority of her co-religionists, she believes that non-Jewish Africans should be treated with compassion and allowed to stay in Israel and make a living legally. Shapiro served the asylum-seeker community as the first social worker hired by the refugee aid organization Assaf. In a 3-part interview that is equal parts heart-breaking and hope-inspiring, Shapiro told me how she, an ultra-Orthodox Jewish woman, came to work with African refugees in Israel, and how news of her work with the asylum-seekers has been received by her religious peers.